When Marc McCauley and Jesse Hahne founded the Center for Advanced Design (CAD), the co-owners contributed their combined experience from having brought more than 1,700 products to market to this leading product development consulting firm. Based outside Minneapolis, CAD strives to quickly create innovative design concepts and efficiently help clients marshal industrial designs through mechanical design, engineering, prototyping, and production. In its efforts to “get the job done fast and right,” CAD had utilized a variety of design tools, including the Alias® and Rhino® surfacing packages for product industrial design, as well as SOLIDWORKS® mechanical design software for internals and production drawings. Although these industrial design and product development solutions allowed the firm to complete its work, CAD viewed the lack of integration between its surfacing and design solutions as an inefficient bottleneck in its development process. Because CAD works closely with their SOLIDWORKS reseller, the product development consultancy discovered that a new industrial design solution—SOLIDWORKS Industrial Designer software—was in development. CAD signed up for the SOLIDWORKS Industrial Designer Lighthouse Program, which provides the opportunity to use the software in production as part of pre release testing. CAD’s involvement in early usage and testing of SOLIDWORKS Industrial Designer software exposed the firm to a better, cleaner approach for integrating industrial and mechanical design. After installing the software, CAD realized just how beneficial SOLIDWORKS Industrial Designer software would be. Not only is it useful for quickly sketching concepts on a Wacom® tablet, creating complex surface designs and rendering high-quality photorealistic images, but it’s also perfect for sharing and communicating design concepts with clients and partners via the software’s SWYM social communications capabilities. The integrated SOLIDWORKS Industrial Designer solution provides CAD with greater flexibility for creating more industrial design concepts in less time. Using SOLIDWORKS Industrial Designer software, CAD can quickly modify industrial designs without having to start over. This capability was especially valuable on the first two projects completed with the new software: a snowbike conversion kit for Kawasaki KLX110/110L motorcycles, which CAD developed for Holeshot, Inc., and a motocross helmet concept. “Industrial design concepts are essentially derivatives of the same foundation,” Hahne explains. 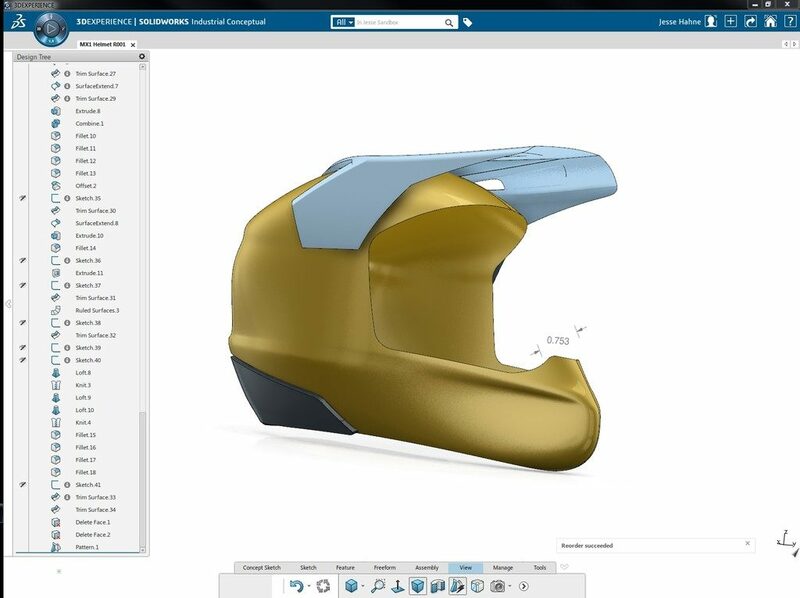 “The beauty of SOLIDWORKS Industrial Designer software is that you don’t have to start over and can work backward to make changes. 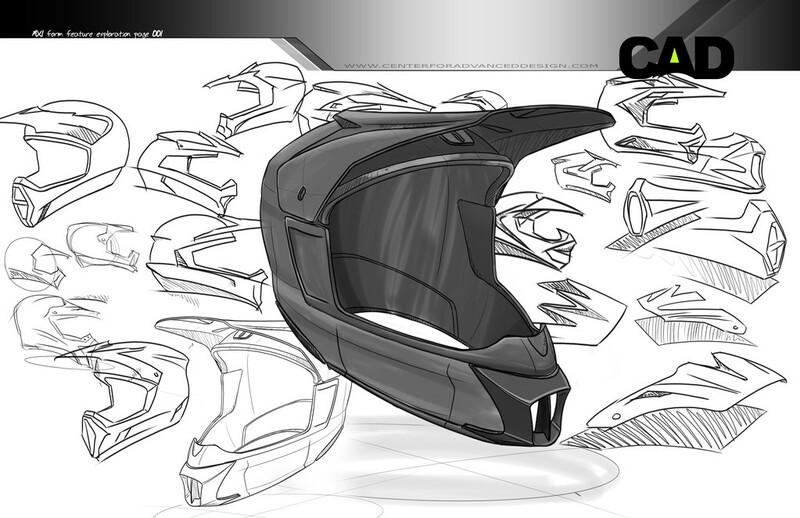 For example, working on the motocross helmet, we needed to change the size of the helmet. Instead of creating a new surface model, I went back to step 10 and went on from there. This type of flexibility translates into time and money. With SOLIDWORKS Industrial Designer software, one person can do in a week the same amount of work that required three people and six weeks in a non-integrated package. Accelerate industrial design development by eliminating repetitive tasks, improving flexibility for making design changes, and streamlining communication of design concepts. Implement SOLIDWORKS Industrial Designer software.